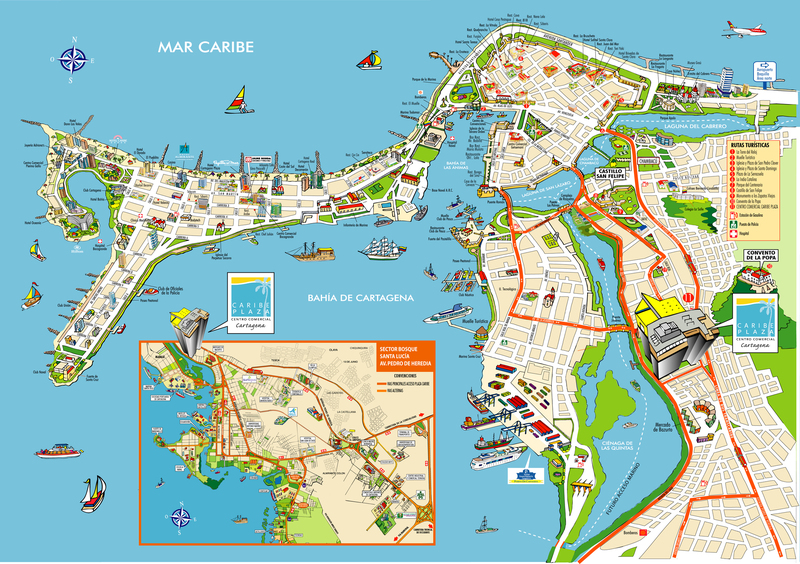 Cartagena map showing the built-up barrier island, port, & high rise hotel sector around the old walled city. I am fortunate to be the rental agent for 3 beautiful apartments(studio, 1 bedroom and 2 bedroom), in the heart of the old walled city of Cartagena. All are located on the 2nd floor above a clothing shop on vibrant Calle de la Moneda. These units are perfect for one to 6 persons. Energy efficient mini splits provides generous coolness on hot days. The mini kitchenette in the studio is equipped with a mini refrigerator, microwave, toaster, coffee maker and large electric skillet. Silverware, cups, plates and bowls are also provided. Other amenities include large ceiling fans, cable tv, wireless internet access, tile throughout, wardrobes, and safes for valuables. The one and two bedroom apartments have fully equipped kitchens as well as the other amenities noted above. Both the studio and one bedroom apartment have beautiful balconies that overlook Calle de la Moneda! The bathrooms are beautiful and modern. All apartments have hot water which is not normally available everywhere in Cartagena. In the hallway that accesses each apartment is a laundry room with washer and dryer, extra linen, beach towels, iron and ironing board, etc. All guests in each apartment have access to this room. Benjamin, our delightful, inimitable and ebullient concierge/caretaker, will be on hand to assist you with any and all of your needs. He does not live on the property, but is always accessible. Benjamin also does double duty- he is an excellent bilingual resource who knows Cartagena (and everyone in it!) like the back of his hand. The Walled City of Cartagena is simply a delight best experienced on foot. My recommendation is to wander, get lost (you really can't within the walls), and take in the wonderfully alive Caribbean atmosphere. Everything you need or desire is within short walking distance of your apartment. A large supermarket, Exito, is just around the corner from the apartment. The iconic ambassador of Colombian coffee, Juan Valdez, now adds his name to a chain of Juan Valdez Cafes, one of which is located just a block away. Beautiful colonial buildings and plazas, cafes, pastry shops, terrific restaurants and bars, museums, the wall itself and the fort - All are within walking distance of your apartment. Calle de la Moneda is typically busy and crowded during the day, but very tranquil and peaceful at night, as there are no bars and restaurants lining our street. It is not necessary, nor is it recommended to have your own car in the Walled City! Walking is definitely the way to explore the area. Taxis abound and are very economical. Be sure to negotiate. You should be able to get around the walled city and surroundings for about 5000 pesos during the day and 6000 pesos at night. Catch a romantic horse drawn carriage to take you back to the apartment at night. If you are interested in booking one of these units, please contact me with your dates and number in your party at gidgetbelize@gmail.com. I will answer any questions you have and send you photos of a unit that is available for the dates you want. I can then send you a booking form. Once you book, I will send you all kinds of useful and fun information. Click for Belize condo options.